I’ve been planning to start with a “real” podcast for some time. Despite what I write below, this isn’t it! A real podcast needs to be hosted on a server designed for the purpose and to have a specially written RSS feed link which can be read by podcast aggregators like iTunes and Juice. I’ve not (yet) been able to make that happen. In the meantime, dear reader, please treat the following as another essay towards a regular podcast. To listen to the following podcast use the control above. To download the podcast as an MP3 file, go here: http://www.ipernity.com/doc/supercargo/8294007 and look for the download button in the top right hand corner. You are about to hear a voice recording in the series Letters from Northern Lands. The text and recording are by me, John Nixon, The Supercargo of www.thesupercargo.com, and are made available under the creative commons license specified at the end of the recording. This first â€œLetter from Northern Landsâ€ is dated 9th June 2010. For months now, Iâ€™ve been looking for a theme for a series of recordings that might become podcasts. This week, this weekend just gone in fact, it struck me that Iâ€™ve been staring at a good theme without seeing it the whole time. Iâ€™m an Englishman, I live in Sweden: why not make that the theme? Actually, there are reasons why not. For example, Iâ€™ve lived here so many years now, Iâ€™m not sure I can any longer certainly see what is unique or peculiar about the place. Of course, Iâ€™m full of arcane facts about Sweden. Did you know, for instance that suede, the soft almost peach-fuzzy leather, gets itâ€™s name from the French pronunciation of Sweden? SuÃ¨de. Originally, the leather was used for gloves, which were called gants du SuÃ¨de â€“ gloves of Sweden. I donâ€™t know anything about the process of making suede, but having spent, now, more of my life in Sweden than in Britain, I fear I may have become SuÃ¨difÃ©. Or Suedifized. A bit like becoming fossilized, only softer. On the other hand, having lived here so long, Iâ€™ve enjoyed (if thatâ€™s the right word) an extensive immersion in the Swedish experience, and that should count for something, surely? Sweden is experiencing international star status at the moment in a way it has not for many years. Popular musicians like Robyn, music video directors like Jonas Ã…kerlund, films like Thomas Alfredssonâ€™s Let the Right One In, and above all, the detective stories of Henning Mankell and Steig Larsson have suddenly raised Swedenâ€™s international profile. Iâ€™m wondering if I can catch this wave and ride it a little. Did you notice what I did just then? Those five references, they were very carefully chosen to ring your Swedish bells. Robyn says she will be releasing three albums this year starting this month, and is planning a tour with the American singer Kellis (and I still remember â€“ and hope some of you will too â€“ her appearance on David Lettermanâ€™s show a year or so ago when he couldnâ€™t let go of her hand). Thomas Alfredssonâ€™s romantic horror vampire movie, Let the Right One In, or LÃ¥t den rÃ¤tta komma in, written by John Ajvide Lindqvist, is currently re-filming (as Let Me In) in an American English version for all the Anglophones who canâ€™t manage to read sub-titles. And for a similar audience, Steig Larssonâ€™s three novels are also to be re-filmed in English, though we donâ€™t yet know who will play Lisbet Selander. Whoever it is will have the unenviable task of out-acting Noomi Rapace in the Swedish language films. Unless you are a music video geek then I suppose Jonas Ã…kerlundâ€™s name was the least likely to ring your recognition bells. But in his field he is very well known and has worked in particular with Madonna. Instead of Ã…kerlund, and because he has worked with Robyn, I did think to mention Thomas Kleerup, but then Iâ€™d have to make a joke about his name and reference another Swede in the news, Carl-Henric Svanberg, Chairman of BP, who certainly needs all the help he can get clearing up the mess his company has caused in the Gulf of Mexico. But I donâ€™t want to do that. Only positive references to Sweden in this first recording, podcast, letter, what have you! When I was in my late teens and twenties, whenever I could, I tried to hear Alistair Cookeâ€™s â€œLetter from Americaâ€. I think it was broadcast on Saturdays with a repeat on Sunday afternoons. For ten minutes, or it may have been fifteen, Cooke and the BBC gave the world his easy, urbane weekly update on American events, politics, daily life and morÃ©s. Wouldnâ€™t it be nice to be able to do something similar? Well, thatâ€™s not going to happen. Iâ€™m not Alistair Cooke, Iâ€™m not reporting from the USA and nobody is paying me to make these recordings (which may anyway turn out to be a very short series). But Cookeâ€™s â€œLettersâ€ are one of my sources of inspiration, and a part of my title is a nod of acknowledgement to his memory. In the rest of the title, â€œfrom Northern Landsâ€, Iâ€™m deliberately trying not to be too specific. A few years ago I started a blog, now languishing, called â€œObserving Gothenburgâ€. I live in Gothenburg, which is Swedenâ€™s second city, and I thought it would be a good title. However, I realised after quite a short while, that I didnâ€™t just want to write about Gothenburg and my title felt like a constraint. This time around, Iâ€™m trying to learn from that experience and think ahead. Of course, as youâ€™ve realised if youâ€™ve listened thus far, my material is going to be mostly about Sweden, but I want to have the option to speak also about other northern lands, about Denmark and Norway, perhaps about Finland and the Baltic States, and possibly even about Iceland. And, of course, there is always the chance that I might find myself talking about that furthest distant archipelago of islands off Scandinaviaâ€™s west coast, the British Isles. I said at the beginning that the theme for this series of recordings came to me at the weekend. The concert was introduced by the leader of the city council who took the opportunity to welcome people who have newly received Swedish citizenship. There was a compare who joked (I think he was joking) about how Sweden is the norm by which the rest of the world is judged. The GSO played, the young Venezuelans played. We sat with friends and listened, talked, applauded, ate a picnic lunch and had a fine time. And I thought, this, this is something I could talk about! But, I really donâ€™t want to find myself doing Swedish Tourist Authority spadework (and for free), so there has to be more. One of my Twitter buddies, Dramagirl Kate, when I asked her what she thought was the attraction of the Wallander and Selander films, said that it was the window they opened on Sweden. â€œThe minutia of everyday life.â€ Iâ€™ve been turning that over in my mind as well. I can do minutia, but how interesting is it if Swedish minutia turns out to be pretty much the same as minutia most everywhere else? Thatâ€™s a risk Iâ€™ll just have to take. So now, coming to the end of my first recording. Iâ€™m planning to make one of these podcasts once a month, though hoping to be a little more frequent. Iâ€™m aiming to make them like this one, about 10 minutes in length. Iâ€™ve no idea if they will appeal to many people â€“ or even to anyone â€“ but they are a way for me to include an updated sample of my voice on my home page as a form of advertisement. If you like my voice and want me to read something for you commercially, or to participate in a pod radio discussion for example, or if you are interested in using these letters in some way, please get in touch. Use the contact form on my homepage. The address is coming right up! That was a â€œLetter from Northern Landsâ€ dated 9th June 2010. This recording, and the accompanying transcript, are licensed under the Creative Commons attribution / non-commercial / share-alike license by me, John Nixon, The Supercargo of www.thesupercargo.com. You may download this recording for your pivate use. You may also freely redistribute all or part of this recording for non-commercial purposes, provided you acknowledge me John Nixon, The Supercargo and include a link to my homepage at www.thesupercargo.com. If you wish to make use of the recording for commercial purposes, please ask. Use the contact form on my homepage. 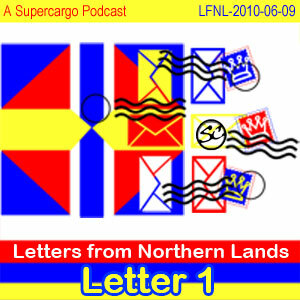 Letter from Northern Lands #1 by John Nixon, The Supercargo is licensed under a Creative Commons Attribution-Non-Commercial-Share Alike 2.5 Sweden License. Based on a work at www.thesupercargo.com. Permissions beyond the scope of this license may be available at http://www.thesupercargo.com.